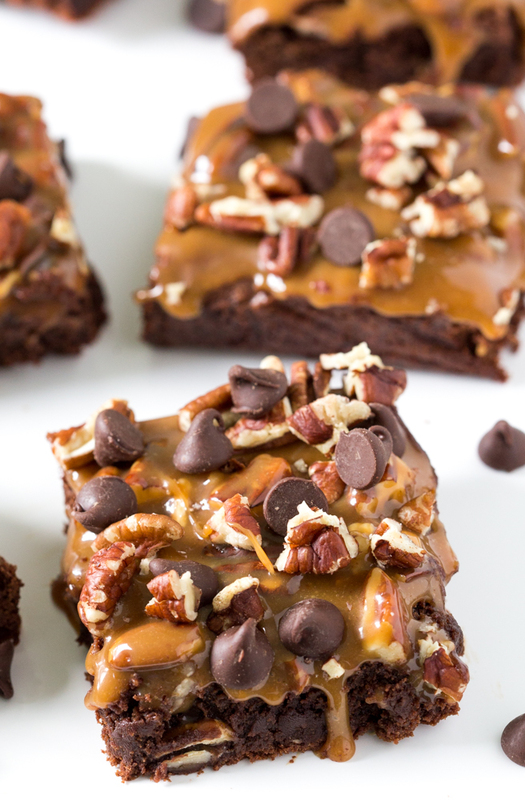 Amazing Thick and Fudgey Turtle Brownies layered with caramel sauce, pecans and chocolate chips. A super decadent dessert! I didn’t think brownies could get any better until I drizzled them with caramel sauce and topped them with chopped pecans and chocolate chips. These brownies are AMAZING! Super rich, fudgey and chocolatey. Firm around the edges and soft and chewy on the outside. This recipe is super easy and doesn’t require a mixer. The hardest part is waiting for the brownies to cool! I used as little flour as possible to get a fudgey, chewy brownie. More flour = a cakey brownie. Less flour = a chewier and fudgey brownie. Brown sugar was added for extra sweetness and to give the brownie extra moisture. You can either make your own caramel sauce or use caramel candies like I did. Either will work and both will be amazing! Love these Turtle Brownies? Here are some more chocolate recipes to try! Line a 9 x 9 or 8 x 8 pan with aluminum foil. Lightly spray with cooking spray or grease with butter. Set aside. Add butter and both sugars to a medium saucepan and stir until melted. Take off the heat and stir in chocolate chips until melted. Add eggs and vanilla to a medium bowl. Whisk to combine. Stir 1 teaspoon of the chocolate mixture into the egg mixture to temper the eggs. Add the rest of the chocolate mixture to the egg mixture and whisk to combine. In a medium bowl combine flour and salt. Add dry ingredients to the chocolate mixture and fold gently. Do not over mix. Add batter to the prepared pan and bake for 25-30 minutes or until the top is set and a toothpick comes out clean. Take out of the oven and allow the brownies to cool completely before taking them out of the pan. Meanwhile, place caramel candies and milk in a microwave safe bowl. Microwave until melted in 15 second intervals, stirring occasionally. 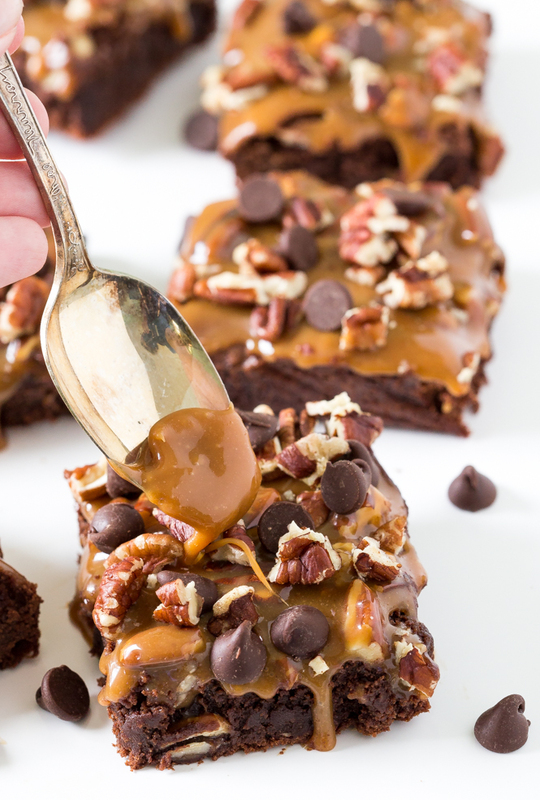 Drizzle the melted caramel sauce on top of the brownies and spread with the back of a spoon. Top with pecans and chocolate chips. Cut into 9 brownies and serve! These would be great if they actually came out fudgy instead of dry and cakey. No amount of caramel sauce would help. Maybe 1/4 cup flour? Wow I’m in love with the caramel topping, Kelley! These brownies sound amazing! I think I would devour this entire pan! Eeeek! I am SO excited over here. I LOVE turtles, I mean caramel and chocolate is always a winner right? 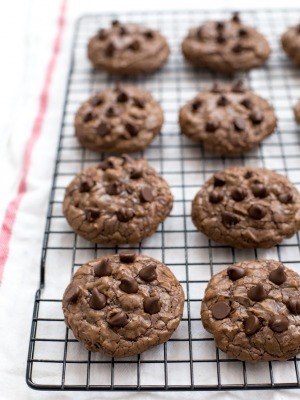 But throw in brownies in there too – its heavenly! Gorgeous photos too! Kelley these look fab-u-lous!! Count me in for anything turtle!! 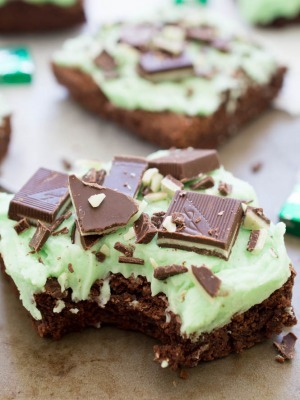 These brownies look insane, in the best possible way! The caramel sauce? Omg, it looks like heaven! OMG my mouth is watering just looking at these pictures Kelley! Brownies are one of my (many) serious food weakness, especially when they are on the dark, fudgy end of the spectrum (definitely a less flour girl!). I love all the toppings you have paired them with here too – especially the caramel! You really couldn’t leave me along with that pan…you might come back half an hour later to find that they had all disappeared haha!! You’re right! These couldn’t get any better! Love that ooey gooey caramel! So easy to make, these brownies look amazing! Great recipe Kelley! I am just drooling over that caramel! Anything with pecans in is good with me, but even better when it combins caramel and pecans. Yum! These brownies are loaded up with seriously ALL my favorite dessert things! That being said, I don’t think I would be able to resist diving into the entire pan. 😉 These are incredible, Kelley! I am like SERIOUSLY drooping Kelley! PAss me the entire tray please?!! Pinned! They look insanely decadent Kelly! 😀 Never tried turtle brownies but definitely need to soon! 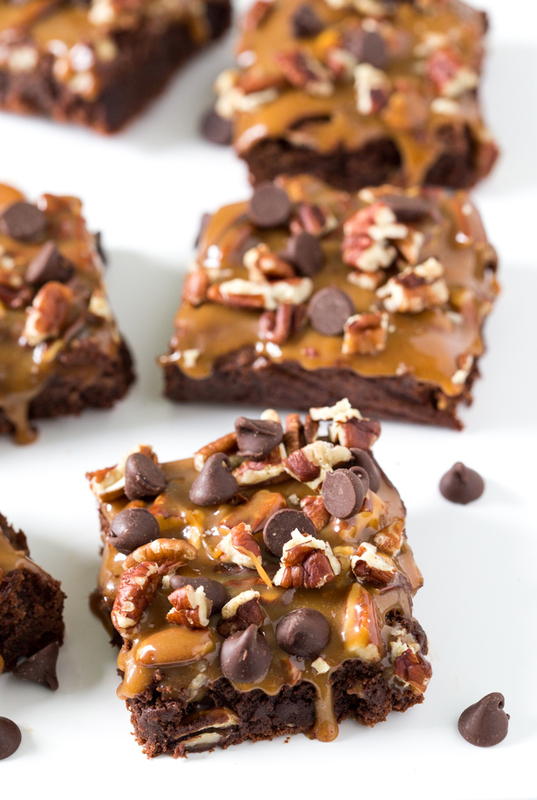 Oh my goodness, I am totally swooning over these brownies! They look so decadent and irresistible!! I made turtle oatmeal bars last month and can’t wait to try these brownies 🙂 Love turtles!